Jeep Safari in Ladakh is a taste of adventure that the ‘Land of High Passes’ has to offer. The challenging altitude, moonscape terrain, and the thrill to face it all, makes for the time of your life. The roads to Ladakh open in the late summer from May to September, while the rest of the year the roads remain covered in snow. Before you embark on Ladakh Jeep Safari, known about the places and routes for the same. The 472 km jeep safari from Manali to Leh is the greatest adventure in Ladakh. Starting from the hill station of Himachal, Manali the route crosses the Rohtang Pass (3890 m), arriving to the mountain paradise of Lahaul. After a break at Jispa, the route passes over Baralacha Pass (4890 m), and finally to the marvelous landscape of Leh. Another alternative is to take the route from Sarchu to Tsokar and Tso Moriri before arriving to Leh. 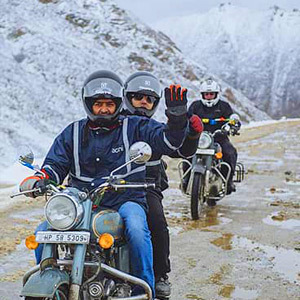 The tour can be also be extended to the Nubra valley across Khardungla pass, one of the highest motorable roads in the world or to Pangong Lake, the majestic lake of multiple shades of blue or to Srinagar after crossing Zojila Pass (3528 m). The jeep safari adventure in Ladakh from Manali to Leh can be completed in two or three days with an overnight stay at Jispa and Sarchu. An easy pace for the jeep safari is a requisite to adjust to the higher altitudes and avoid AMS (Acute Mountain Sickness). Route: Manali-Leh via Rohtang Pass, Baralacha Pass, Khardungla (if extended to Nubra Valley), Chang La (on route to Pangong Lake) and Zoji La Pass (incase extended till Srinagar). Set 160 km from Leh, Pangong Lake is one of the best places to visit in Ladakh. Famously known for the shooting location of the popular Bollywood movie ‘3 Idiots’, the lake is a beauty. What is even better, is the route which you can enjoy while on jeep safari from Leh to Pangong. The lake is snuggled in middle of the barren mountains, displaying a number of shades of blue with backdrop of clear skies dotted with clouds. Start with your favorite jeep safari expedition in Ladakh with pictorial view of Shey monastery and Hemis Monastery. The route also covers the beautiful Thiksey monastery, famous for its architectural similarities with Potala Palace of Lhasa. The highlights of the scenic route comes at Chang la Pass (5,360 m), one of the scenic high mountain passes in Ladakh. Scenic villages fall on the route that give a glimpse of the charming Ladakhi lifestyle. On arriving at the Pangong Lake you will be spellbound. Camp at the shores or enjoy a short safari upto Spangmik village. Route: Leh to Pangong via Chang la, with stops at Shey, Hemis and Thiksey Monasteries. Coming on to the next amazing jeep safari route in Ladakh, Nubra Valley is pretty much beyond imagination. 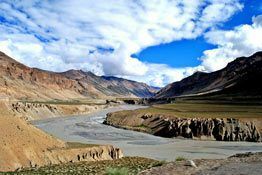 Located 120 km from Leh, the valley is a natural wonder. Here you can find the highest desert in the world, marvel at lush fields, charming villages, ancient monasteries and beautiful scenery. The safari takes you across the Khardung La (5,359 m), one of the highest motorable passes in the world. 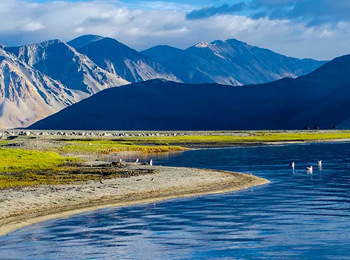 Traveling on this famous route is one of the best main attractions of Ladakh. On your adventure tour, consider exploring Diskit Monastery, Samstaling Monastery, Hunder Village and safari at the sand dunes riding the unique Bactrian Camels (Double Humped Camels). The safari trip covers overnight stay at the desert camp, excursion to nearby villages. Route: Leh to Nubra Valley via Khardung La. 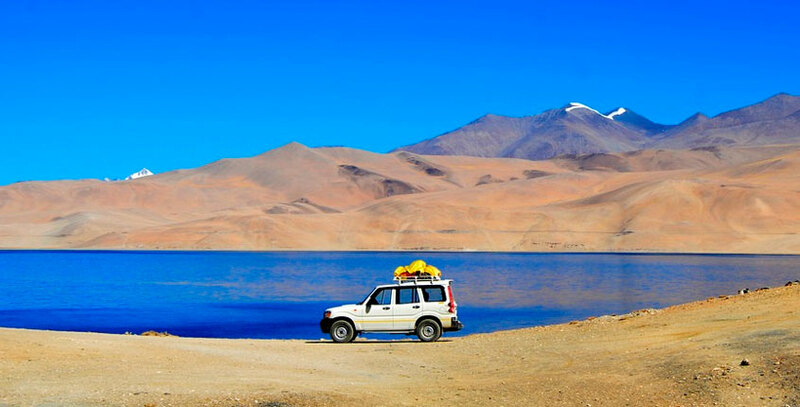 The scenic journey to Tsomoriri Lake from Leh is about 240 km. 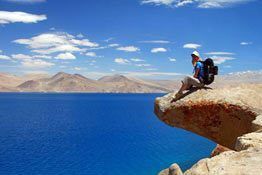 One of the highest lakes in Ladakh, Tso Moriri is a beauty that come along with thrilling adventure. 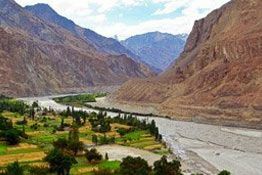 The route covers Shey, Thiksey, Upshi and many other small villages along the Indus River. The highlight of jeep safari from Leh to Tso Moriri is the hot spring at Chumathang (3965 m), where taking a bath is said to heave therapeutic value. Enjoy full day walking tour of Tsomoriri Lake, visit to the famous Karzok monastery and the nearby villages. Rich in wildlife, the area is also known for spotting the incredible species of the Great Himalayan Region. There are also options of jeep safari from Manali via Tsokar Lake and Sarchu or visit Tsomoriri before returning back to Manali. Route: Leh – Tso Moriri via Chumathang with stopovers at Thiksey, and Shey monasteries. When it comes to exciting adventure jeep safaris in Ladakh, the Srinagar to Leh journey is equally exhilarating as the drive from Manali to Leh. From breathtaking views to crossing mountain passes, the Srinagar to Leh jeep safari is truly memorable. The almost 440 km long Srinagar-Leh highway crosses the scenic hill town of Sonamarg, Drass and also running alongside the Indus River. The route enjoys picturesque views. Challenges on this route are few compared to the Manali-Leh route but is equally amazing if not more. 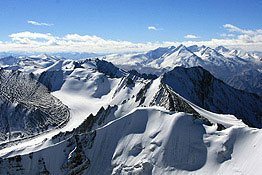 The highlights of the route include the three high mountain passes named Zoji La (3528 m), Namki La (3815 m) and Fotu La (4108 m). The 5-6 day jeep safari tour covers the enticing charm of Ladakh. Route: Srinagar-Leh via Zoji la Pass.